So the new jean for fall is definitely high-waisted. I've been looking for the perfect pair and finally found it. This Earnest Sewn pair keeps all the details simple and streamlined, which is what such an "aggressive" shape requires. All pairs of high-waist jeans I keep seeing have big belt loops, or multiple waistbands or oddly placed pockets. They are a little pricey ($240) but absolutely worth it when you know you'll wear these jeans forever. 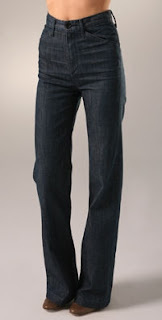 This is an absolute classic pair of jeans; pockets where they need to be, button fly and back pockets. They come in a dark wash and also in powder blue and can be found at Shopbop.